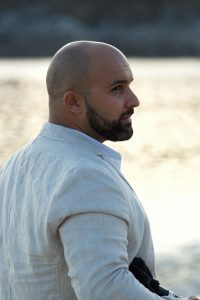 Xulio Lorenzo is a Galician musician and composer who was born in Louredo, a parish from the district of Mos that belongs to the county of Pontevedra. He started studying how to play the badpipe in 1992 in the cultural association of his birthplace hand in hand with some renowned pipers from that place such as O Señor Xosé, also known as Dornelas, and later with Mr. Xosé Cortizo, a great master but mainly a great friend. At the age of 15, he started to be a member of the folk group Eimiñavella from Reboreda, Redondela, in the county of Pontevedra. In 1997, he became and integral part of the bagpipe band called Xalabal from Vigo, directed by the master among masters, Antón Corral. During that time, Xulio met great artists and fellows from whom he could learn the secrets of the Galician pipe. 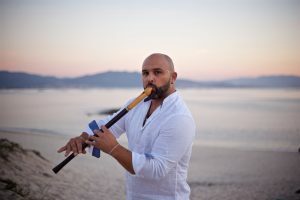 After some years of self-taught formation, Xulio Lorenzo decided to take some courses with the best musicians from Galicia such as Anxo Lorenzo and Anxo Lois Pintos (Hurdy-Gurdy), until he developed a strong relationship with one of the greatest pipers from Galicia, Óscar Ibáñez. It was with him that Xulio could not only learn the secrets of the whistle but also improve his technique collaborating with Ibáñez in several concerts and presentations. As a musician, Xulio Lorenzo founded the group Xabenga Folk. 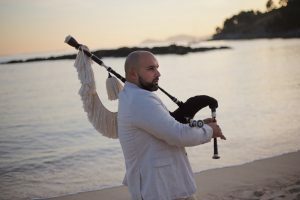 He also engaged in some local groups widely recognised in the traditional Galician music, Arume de Guizán, Donicelas, Os Chavellos, Banda de gaitas Charamuscas (Charamuscas pipe band), as well as collaborating with many artists. As a composer, he is the author of works for pipe, recorder or whistle. Muiñeira de Mos and Alborada Camiño da Rosa should have a special emphasis here since they are dedicated to his birthplace, the latter performed with some groups from Mos at the time it was presented. More than 80 musicians performed Alborada Camiño da Rosa that day. As regards Xabenga folk group, he mainly played in the southern part of Galicia and organized charity concerts to gather donations of food, clothing, toys and caps for assisting the most deprived people. In 2015, he started a new musical adventure in Brazil, a three month tour hand in hand with the pipe group known as Gaiteiros de Lume and its director Luis Fitzpatrick. There, he became a member of a very successful group in Curitiba (an area of Southern Brazil), so he could play in many concerts all over the state as well as participating in the recording of the second album of the Curitibian group. He did also collaborate with the Spanish Cultural association in Panama and specially with the folk association Aires Galegos. Just back in Galicia, he had to pack his luggage again and travel to Italy where he had been invited to go on a tour with the Neapolitan group called Brigan. At the end of 2015, he decided to give shape to his own compositions together with a team comprised of great musicians on today’s music scene. Paco Dicenta (Electronic bass, piano and musical arrangements), Diego Bea (Guitar), Ioana Pérez (violin), Roberto Comesaña (Accordion), David Outumuro (Drums), Francesco Di Cristofaro ( Brigan Italia) Alberto Vilas (Piano). For the recording of his first album, Xulio is honoured with the presence of such international artists as Bieito Romero (Luar na Lubre), Marcos Campos (Crema de Gaita, Riobo), Pedro Fariñas (Trim, Transilvanians) Alberto Vilas (Tangata, Alberto Vilas Quartet), Noelia Alvarez Rodríguez-Osorio (Two in the mirror, Aretha Franklin Tribute Band) Marisé Balado (Arume, Orquesta Sondeseu) and the pipe group Xarabal.